First of all, thank you so much if you commented on my last post! I am going to be replying to comments over the next few days, but I was just blown away by everyone’s advice and encouragement on sharing info about our pregnancy. I love blogging not only because it’s like a digital journal, but for the friendships I’ve made with blogging friends and readers over the years. It’s just very special, you know? Okay, so I actually have pictures of food! I used to blog about food all. the. time., but I think I developed interests in other things over the years like dogs, gardening, photography, and …. dogs and started blogging about those things more than just food and cooking 24/7. Okay, I’m rambling. Here are some things I’ve cooked, ate, or drank lately. 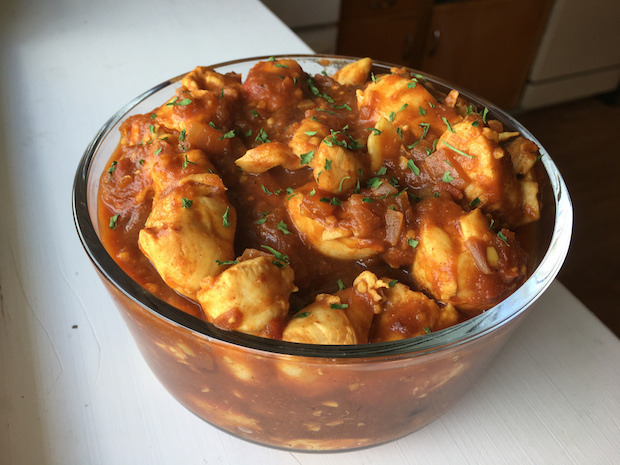 Chettinad chicken masala from this cookbook. I have to admit, I was so intimidated when I started looking through the cookbook since it’s really authentically Indian and kind of felt like reading a different language, but I’m glad I tried this recipe! Do you like Indian food? 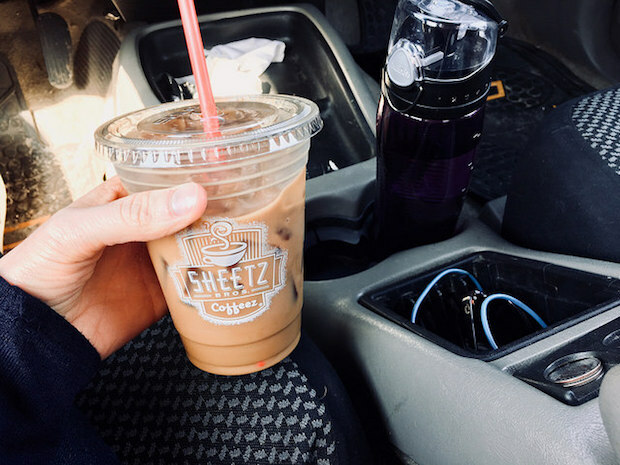 A decaf iced vanilla latte from Sheetz. I think Sheetz is only in a few states on the east coast, but it’s a gas station with pretty decent made-to-order food and drinks! My only gripe with Sheetz is that the above coffee is a medium and seemed so small compared to the medium Dunkin’ Donuts latte I shared in my last post, haha. Alright, last food related thing! 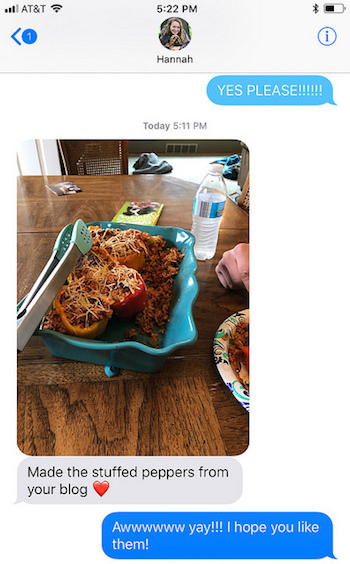 My sister texted me last night to tell me she made the stuffed pepper recipe from my blog and it made my day. 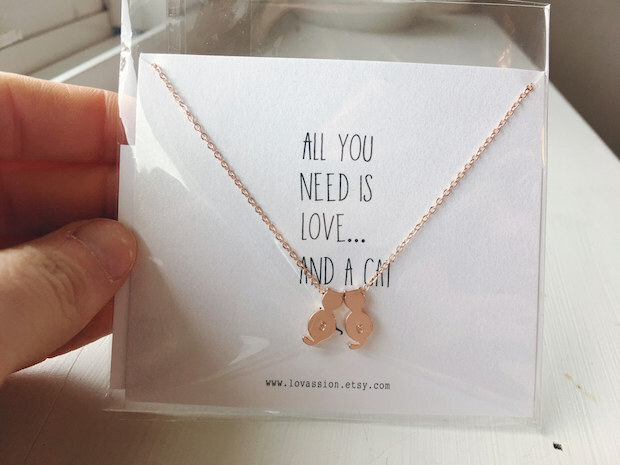 I bought her this personalized cat necklace on Etsy and think it’s absolutely adorable. It’s from the shop Lovassion and each cat has an initial on it that stands for each of her and my brother’s cats. The one on the left has an “S” for Simba and the one on the right has a “G” for Gemma. 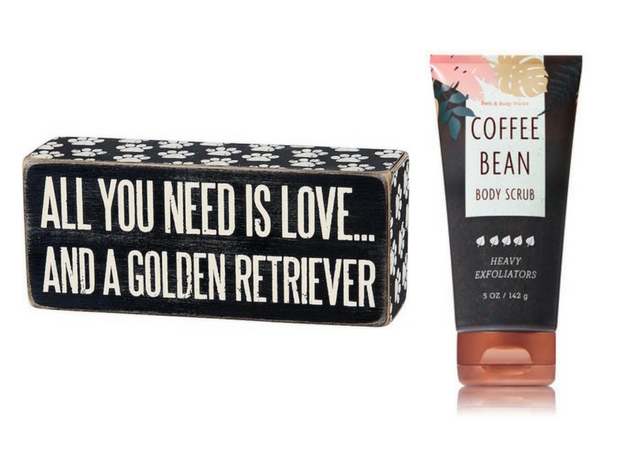 I also ordered her this sign and bought her this body scrub from Bath and Body Works. As you can probably guess, she loves cats, dogs, and coffee! I’ll probably be on the lookout for a few other things this weekend. Maybe some good coffee or her favorite candy? What’s the best thing you’ve cooked or ate lately? Thank you, Maureen! It’s one of my favorite oatmeal “recipes” even though it’s kind of flexible and like a pinch of this and that haha. It totally tastes like dessert, especially if I add maple syrup to it! Those gifts for your sister-in-law are perfect! I’m sure she’ll love them!!! And I can’t wait to watch your vlog… 🙂 All your vlogging is giving me an itch to put together a vlog too! It’s been awhile since I’ve done one. I don’t really cook, lol. The best thing I’ve eaten lately? Probably the wrap from Publix that I got yesterday. Publix is a grocery store here that has fresh made wraps. I’d been in the doctor’s office all morning and hadn’t eaten so it tasted soooo good when I finally got to eat! Your chicken dish looks amazing, and I have been to Sheetz, they have them in NC but not here in SC. I’m glad you can tolerate coffee again with the pregnancy, too :). That’s right! You said Clay does more of the cooking than you, right? The wrap from Publix sounds good!! I just love a good wrap. I know what you mean about food tasting like 1000x times better when you’re starving haha. I don’t think I have tried Aloo Gobi BUT that is going to be on my to-make list now!! Curry + cauliflower sounds like perfection to me! Every time my boss or I go through PA we talk about how half of the reason we go is to head to SHEETZ! BTW, I will be at the Silo District Marathon so can we meet up? 607-220-4655 text me! Hahaha, yes! Sheetz for the win!! I won’t be at the Silo District Marathon, but I think my parents will be (my mom has an injury, but I believe they’re going to try to do the 5k instead of the half) and they said they’d love to meet you!! My mom is a fellow upstate NY-er like you, so I think she’s extra excited to possibly meet you!! I will pass your number on if that’s okay?! The Gourmet Oatmeal is the best! Your gourmet oatmeal looks sooo delicious. And good job with the gift for your sister in law. I’m sure she’ll love that you included all her favorite things. So thoughtful! Thank you so much! It’s definitely a favorite meal of mine lately! I am so, so pumped to give my SIL her gifts!! Kevin and I just made your gourmet oatmeal for breakfast. We added a little chocolate protein powder and chia seeds. It’s so good! Thanks for sharing here! Indian food is absolutely delicious and I’m so impressed at your cooking skills! As much as I love Indian food, I am definitely intimidated by recipes when it comes to making it from scratch. That looks amazingly tasty though, so I’m sure it was well-worth the effort! Indian food really is so wonderful! I’m glad you like it, too! I feel like people either love it or hate it and the people that hate it are missing out! The recipes are so intimidating, right?! The ingredients and preparation steps can be so overwhelming, but like you said, well-worth the work! I am pretty sure you’re totally accurate with that estimation! I don’t understand who hate it because it’s so delicious! Joshua and I love it so much that we even had an Indian food feast for our first married Thanksgiving together. It didn’t actually satisfy “Thanksgiving” cravings, but it was still great lol. Chicken tikka masala and naan are the only two Indian foods we eat regularly, but we LOVE them. So so good! And good for you for stepping out of your comfort zone with making this dish. That can be so intimidating! 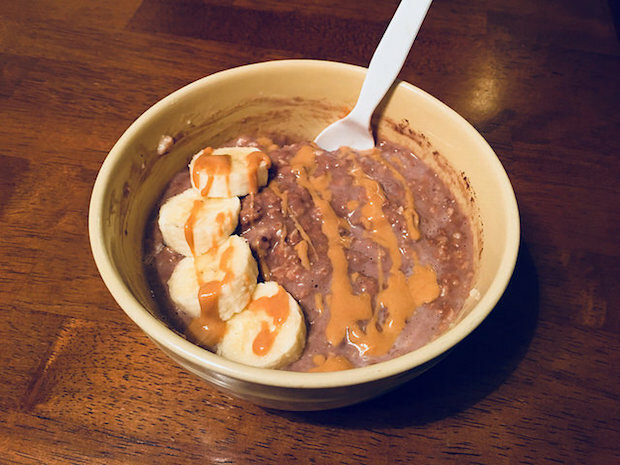 I have made that same type of oatmeal (with cocoa powder, bananas, and PB) – I call it chunky monkey oatmeal. So yummy! I cannot believe you guys are still getting SNOW! That’s just crazy. I would not do well living anywhere north of where I am now. 😉 You are totally rocking the spring vibes with that pom pom scarf. So cute! That poor cashier! I’m so glad you and the guy in front of you were able to encourage her a little! How cute are you for leaving sweet little gifts behind for Jimmy while you are away! Baby kicks! YAY! ❤ Also, I love seeing Mavis loving on her baby sister/brother already. So sweet. Hahaha! I love that he knew you were vlogging when he came home! "It's too quiet" haha! I'm glad you liked the birth doula. I want to hear more about your visit with her! Mmm, I am craving a big piece of naan now as I reply to your comment! It’s just so delicious!